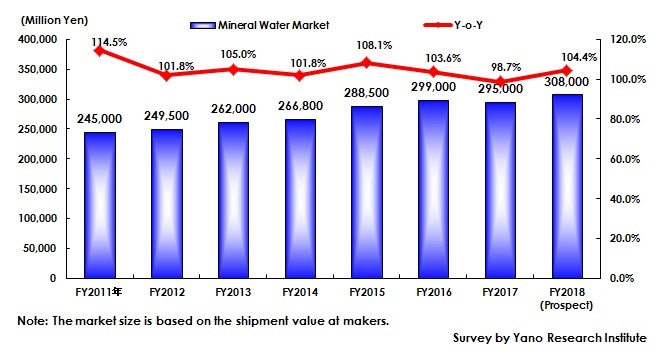 Yano Research Institute (the President, Takashi Mizukoshi) has conducted a survey on the domestic markets of mineral waters and water delivery services, and has found out the market trends by segment, the trends of market players, and the future perspectives. The mineral water market size based on the shipment values at makers for FY2017 has turned for the worse to scale down for the first time since FY2010 to 295.0 billion yen, 98.7% of the previous fiscal year. Although the market has declined in FY2017, mineral waters have grown to build a robust position in the beverage market, with the size following the markets of coffee drinks, Japanese-tea drinks, and carbonated beverages. 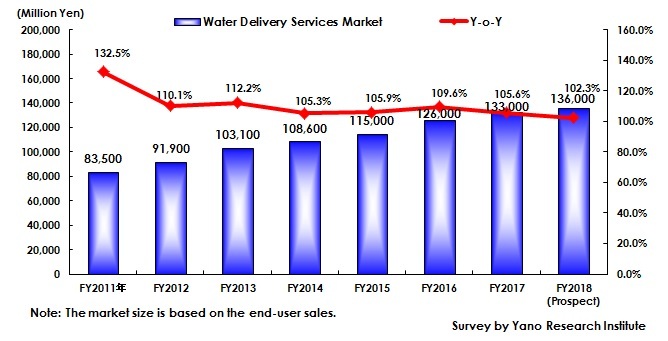 ​The water delivery business in FY2017 based on the end-user sales has shown continuous growth to achieve 133.0 billion yen, 105.6% of the size of the preceding fiscal year. The market expansion has been triggered by the needs of water just after the Great East Japan Earthquake, increasing the number of companies entering the market. The market has grown so rapidly that its size in FY2017 was larger by 59.3% from that of FY2011, outperforming the growth of the mineral water market. On the other hand, the market environment has become severer, with the growth rate slowing down and the competition among market players becoming ruthless. As more consumers come to demand the kicks and refreshed feelings of carbonated drinks, more attention on carbonated waters have been paid, which encouraged each maker to take proactive attempts in promoting and releasing new products since the beginning of the year. While non-sugar tea drinks and mineral waters have shown rapid growth in the entire beverage market, new products of carbonated waters released one after another have driven fiercer competition among such products but at the same time, expanded the carbonated water market furthermore. The major growth factors of carbonated waters are: Wider variety of categories in carbonated drinks from colas, those with fruit juice, flavored types, “transparent” types, to “energy” types; and increased opportunities among consumers to drink unflavored types. That said, however, it is difficult for the market to continue growing, because there are few differentiation factors in carbonated waters. 2.Research Object： Beverage makers, makers of waters for delivery services, etc. Mineral waters in this research indicate domestic or imported products sold by the name of natural waters, natural mineral waters, mineral waters, and bottled waters. Sparkling waters sold as mineral water, and flavor waters are included in this research. (Naturally carbonated waters are also included.) The following waters are not included: Mineral waters packed in Bag-in-Box, and mineral waters delivered by water delivery services. A water delivery service in this research consists of a packaged service of delivering water and lending a water server to households and offices. Such water delivery business without lending a server and home delivery services of plastic-bottled water are not included in this research.